I have grown up from a childhood full of Kirby, in fact Kirby was my first ever video game that i purchased. I was maybe 4 years old and Kirby's tilt & tumble was my first game. Since then, I've been hooked and whenever I would see Kirby at the store, I would make sure to beg like the brat I was to my mom until I got the game... But one game that never came across my path is Kirby Super Star. I never owned an SNES, andby the time Ultra released , the 3DS was just announced so I wasn't that interested. Turns out, I just did my life's biggest regret. Over the years, I would hear more and more about how Kirby Super Star Ultra is the best Kirby game of all time. or should I say games... Kirby Super Star Ultra is a compilation of short games with different styles of gameplay and their own story. But are they all the best of the Kirby series? Or do some just stick out as "I don't wanna play this game because of this" . It's extremely hard to put a bunch of different gimics, and ideas into 1 game and make it work, but if anyone should take notes from anyone about this, it's from Kirby. Now I won't be making a "Story" Section of the review for once due to all the different stories that happen. But I will mention it in the graphics and the gameplay section. Ultra is a re-release and re-master of the classic Kirby Super Star on the SNES, and the graphics are about 100X better than the original. This time, CGI Cutscenes explain every story with so much dept that I forgot the DS can even process. The sprites are detailed, full of emotions and color. If you're playing a certain game, you know you're playing that game. There's no re colors of anything, every game is built from the ground up and every game has it's own surprises of backgrounds, worlds to explore and more. The way every game was also designed is just unimaginable on the DS. Spring Breeze has you going through a series of levels while the Great Cave Offensive has you explore 1 large map that you will get lose in, followed by Milky Way Wishes where you are exploring the galaxy going from planet to planet. Every game feels fresh, new and you don't know what you're getting until you do, and your eyes cry of joy every time from how much care was put into the art. 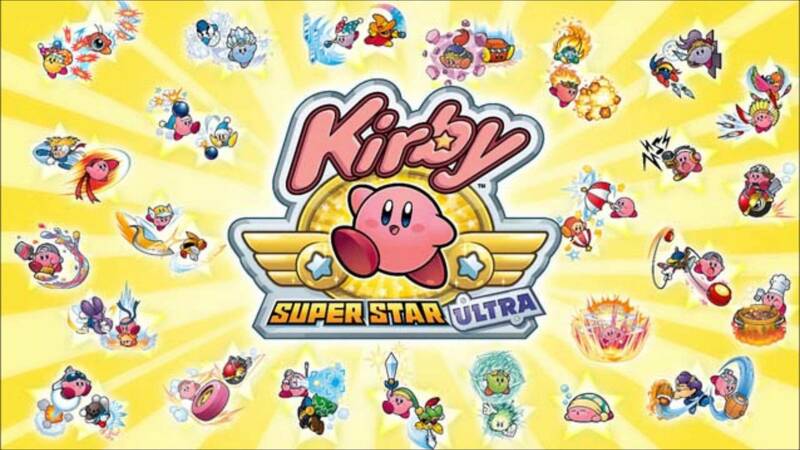 Kirby Super Star Ultra as other Kirby games do, re cycle and remix the top of the Kirby music. BUT the remixes are fantastc, and the new tracks are just as good. The new sound effects that aren't so much used anymore of Kirby getting hit, you hear a squeak as if it's kirby screaming in pain, is just a nice touch and makes you hate that fact that you got hit just a little more... The way the wind blows, the climax at the end of a story event etc. The biggest areas I really appreciated the music was during the True Arena, where it really feels that your life is on the line and you hear your heart racing with the tune that plays in between battles and during. Metaknight's Revenge as well has really great tracks to keep with you on the go! In general, each piece has been crafted with passion and dedication to giving us what Nintendo wants us to feel when as play as Kirby and exploring the world that he lives in from the first title to the last in the cartridge. I'm going to my absolute best to explaining every single mini game, but the main gameplay is simple. Kirby is back, and he's got more than 1 adventure happening at once. You gotta jump your way from point A to B while inhaling, copying and slaying a few abilities on your way to the goal but this time, complete missions as you go. There are 11 Games to complete within the 1 game you buy and they all have amazing replay value. This is not even including the 5 mini games that you can just sit back, and enjoy for fun with friends on the side via wireless connection. Spring Breeze is the first game you start with, which is a sort of Kirby's Dreamland play where yougo across levels and get to the end. There's nothing to collect, but just get from Point A -B Gourmet Race is a race between you and King Dedede, short but super fun. Kirby is super quick and you have to eat your way to victory by not only passing the line before DEDEDE but to also eat more than him. DinaBlade is another adventure mode as Kirby, but the greatest challenge and probably the longest mode of all is the Great Cave Offensive which after playing, I know see what Sakurai based the Subspace Emissary in Super Smash Bros. Brawl off of. It's a complete replica, but a smaller map. Kirby must explore a giant maze while collecting Treasure Chests . The goal is collect all 50 before the goal, and the are NOT easy to find. It took us during our lets play a good 2 and a half hours to complete this mode. It was long, and stressful over the worry that if we died, we had to restart from the last save point which are far apart from eachother. Once we made it out of the maze, we we're off to the Revenge of Metaknight which has Kirby stopping Metaknight from his plans. He crashes Metaknight's ship and hunts him down for a duel which he must defeat him in. During the play, fun dialog between Metaknight and his crew happens and it makes the story all the more engaging. Next is the Milky Way Wishes which has Kirby traveling in the galaxy from world to world as he instead of copying abilities, he finds them hidden and keeps them. This really changed things up and made it interesting because not only were the powerups very hidden, but switching through each powerup whenever I wanted was really interesting and created fresh moments in Kirby. Once Revenge of the King unlocks, things get hard and I mean DAMN challenging. this mode is probably the final easy mode, which is Kirby hunting down King Dedede to stop him from his future plans and defeats him in battle. MetaKnightmare ULTRA later unlocks, which is a speedrun mode while you play as Metaknight and he was super fun to play as. He's faster, stronger and was an overall game changer. You must complete the stages of the Milky Way Wishes mode you have done with Metaknight as fast as you can, on hard mode. The Arena will be ready for you to challenge when ready if you dare. This is a boss rush mode which consists of you choosing whichever ability you want, and a limited supply of healing items as you defeat all bosses in the game that you have fought through the entire game in a row. This took me a while, a few tries and when I finished it I thought I was done... until the TRUE Arena unlocked, which I then cried and proceeded to fight a HARD mode of the Arena which has mode bosses, surprises, and LESS healing items. You think you're done? You're not. The final mode to unlock is Helper to Hero, which is a shorter version of the True Arena but just as hard. This time, you take control as an enemy in the game or so called "Helpers" which is the main new gameplay style in Kirby Super Star. Kirby like in Allies, can inhale enemies and turn them into a friend. He can have 1 friend, along with himself and an ability he has as they travel through together making Kirby stronger. In Helper to Hero, you use one of these helpers and challenge the True Arena once more. Once this was done, I have completed Kirby Super Star Ultra at 100%. The game rewards you with a screen thanking you for completing it, and calling you a Kirby Master which Nintendo tells you that you are finished, and thanks you for playing the game. Everyone was right. This really is the best Kirby game. For me personally, it's a top 3, but the challenge, the replay value, the addiction I had with this title was like no other during my playthrough. It was so fun I couldn't put it down until I finished. It's new gameplay mechanic of making helpers that returned only 10 years later was super fun, but honestly pointless to me. Sometimes the AI would get in my way, or make the game too easy. There was no NEED to use the helper if I didn't need to. I played mostly solo, the challenges and adaptations I had to make in every mode was just intriguing and I was pretty sad when things were over. I wanted more. It really feels to me that Kirby is the master of Party games being implimented into a real adventure game. This game could have told a whole different story of "oh its just a party game its not a real kirby game" and notplay well either, but man this really ended up being a genius of a game. Thanks to everyone who has made me play this because I would have regretted it if I died knowing I never played the best Kirby game to date. I?m glad you really enjoyed this Kirby game.